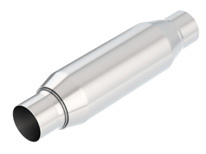 If you want to lower the sound pressure level (SPL) of your new CrateMufflers™, you can install the Resonator Option. The Resonator Option is designed to attenuate overall sound. This is perfect for customers looking to reducing the sound level 2-3 dB(A). This straight-through design will not degrade the performance of your vehicle. CrateMuffler® Resonator Option 2.25" Center/Center 3.5" Round X 10"